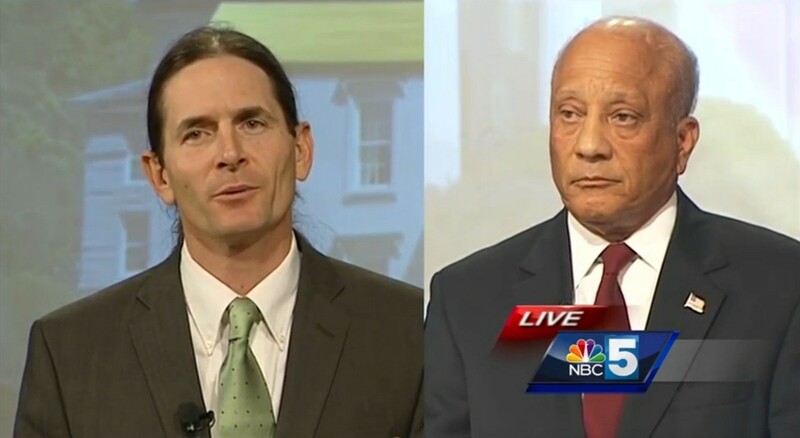 Sen. David Zuckerman (P/D-Chittenden), Vermont's Democratic and Progressive nominee for lieutenant governor, apologized Monday night for questioning the role that the Vermont Air National Guard played in the response to the terrorist attacks of September 11, 2001. "I spoke poorly and I do apologize for that," he said at a Burlington debate hosted by My NBC5. Zuckerman was responding to a May 2013 video posted to Facebook on Sunday by Nicole Citro, a Republican activist who has led the public push to base F-35 jets at the Air Guard's South Burlington headquarters. The video shows Zuckerman speaking out against the basing, which has since been approved, during a protest on the steps of Burlington City Hall. "Some of the people that support F-35s say, 'This is about our safety and our freedom. Look at what they did on 9/11,'" Zuckerman says in the 27-second video. "When I look at what our planes did on 9/11 — they flew over a site that was already devastated by a terrorist action. I don't believe they stopped a single thing from happening. So let's not equate their existence with freedom when they're after the fact—"
According to news stories and the Air Guard's own account, Vermont's F-16s were among the first on the scene after terrorists flew two airliners into New York City's World Trade Center. They patrolled the city's airspace for 122 consecutive days after the attacks, according to a Guard history. In a statement issued Sunday, Citro noted that the lieutenant governor could be called upon to command the Air Guard if the governor was not available. She said that Zuckerman's 2013 remark "shows unequivocally he is not fit for the importance of this role." Asked about it at the lieutenant gubernatorial debate Monday evening, Zuckerman made clear he regretted his comments. "I have tremendous respect for our service personnel and the Guard and national service, as well, for their willingness to put their lives on the line for all of us — whether it be in a terrorist situation, a national tragedy or, as we had in Vermont with Hurricane Irene, a natural disaster," the senator said. "Our Guard, whether it be the Air or Army, serve us at the drop of a hat, putting their families aside. And I have tremendous respect for all of you. And I want to apologize again for speaking very poorly at that event." Zuckerman's Republican opponent, former state senator and auditor Randy Brock, said he was "very, very concerned" about the remark, calling it "extremely unfortunate." "It shows that Sen. Zuckerman, I believe, is far outside of the mainstream thinking on the value of our Guard and the importance that it plays in the defense of our country," Brock said.